This guide was created to accompany the Muslim Journeys Bridging Cultures Bookshelf exhibit and events during 2013-2014. They contents are not currently being updated, other than maintaining links. We hope you enjoy the information within! Koran by Heart - Monday, October 7th, 6:15 p.m. In this 80-minute documentary, three 10-year old children leave their native countries to participate in one of the Islamic world's most famous competitions, a test of memory and recitation known as The International Holy Koran Competition. As the competition reaches its climax, Koran By Heart offers a compelling and nuanced glimpse into some of the pressures faced by the next generation of Muslims. (See our 'Films' page for more information about this film and to view the trailer.) Dr. Ovamir Anjum, the Imam Khattab Chair of Islamic Studies at the University of Toledo, will lead the discussion following the film. 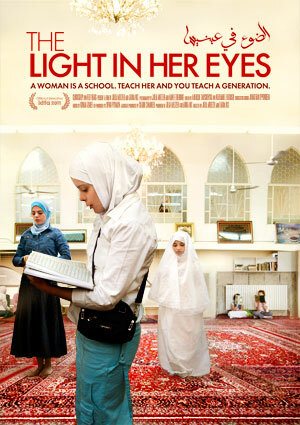 The Light in Her Eyes - Monday, October 21, 6:15 p.m.
Houda al-Habash, a conservative Muslim preacher, founded a Qur'an school for girls in Damascus, Syria when she was just 17 years old. Every summer, her female students immerse themselves in a rigorous study of Islam, in addition to their secular schooling. A surprising cultural shift is underway-women are claiming space within the mosque, a place historically dominated by men. Challenging tradition, Houda insists education for women is a form of worship. Using Qur'anic teachings, she encourages her students to pursue higher education, jobs, and public lives, while remaining committed to an interpretation of Islam prioritizing women's role as wives and mothers. In a world rarely seen, The Light In Her Eyes tells the story of a leader who challenges the women of her community to live according to Islam, without giving up their dreams. Shot right before the uprising in Syria erupted, the film is an exclusive look at a social movement thriving in a country controlled by a repressive regime. Dr. Sarah Anjum, scholar of Near East Studies, University of Chicago, will lead the audience discussion after the film. Professor Carolyn Putney, director of collections, chief curator and curator of Asian art at the Toledo Museum of Art, will present an introduction to Islamic art incorporating materials from the TMA's own collections and video shorts from the Islamic Art Spots film produced for the Muslim Journeys exhibit. The presentation will begin at 7:30 p.m.in the Little Theater at the Toledo Museum of Art. Admission to the museum is free, but you may pay for parking. Enter a keyword to search the collection. The Muslim Student Association on UToledo's Main Campus and the University Libraries have joined to sponsor this book discussion. During February and March, we will all be reading F.E. Peter's book, The Children of Abraham: Judaism, Christianity, Islam. This book explores the shared history of these three monotheistic faiths, which all trace their origins to the patriarch Abraham, and discusses both parallels and differences. At the MSA meeting on Thursday, February 7th (6 pm, Student Union), we will receive a brief introduction to the book and distribute copies. The Friends of the University Libraries have generously donated ten copies for participants; others may request copies from other OhioLINK libraries. As we read the text, supplemental materials and discussion questions will appear on the Facebook page for the book discussion event. RSVP yes or 'maybe' to the event to keep up with these helpful additions as you read. We'll all meet on Tuesday, March 19th during Islamic Awareness Week at UToledo to discuss our impressions of the book, what we learned that was surprising, confusing, or just interesting. Let us know you're coming to the discussion on the 19th of March, or RSVP 'Maybe' to continue to get supplemental information and encouragement while you read. Request the book from OhioLINK! You can request an available copy from one of our OhioLINK partner institutions. It will arrive in 3-5 days, and you'll be able to check it out for 3 weeks, and renew it online! Best of all, it's free! Examines the meaning of Islam and its Five Pillars, both within a Muslim context and in relation to the Christian and Jewish traditions of Abrahamic monotheism. The purpose of hijab, the distinction between individual and congregational prayer, and mosque design are given special consideration, as are the Virgin Birth, Jesus, and an almighty God. Compares similarities and differences in religious beliefs and practices that Islam has with Christianity and Judaism. 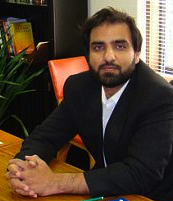 Dr. Ovamir Anjum, the Imam Khattab Endowed Chair in Islamic Studies, will give his annual lecture on Thursday, March 21st at 7 p.m. in the McQuade Law Auditorium, UToledo College of Law. This year's lecture is entitled, "Good Muslims, Bad Muslims, and the American Dream". In this talk, Dr. Anjum will present attempt to think past the hegemonic construction of what it means to be a good Muslim in the American public life, and how that may undermine the critical voice Muslims could otherwise add to the alarming situation of our environmental, economic, and political attitudes. We hope that you will join us. The Friends of the University Libraries will be sponsoring refreshments after the talk, and more information about the Muslim Journeys Bridging Cultures Bookshelf will be available. Other lectures (including previous Imam Khattab Annual Lectures) by Dr. Ovamir Anjum, made available through Knowledge Stream.